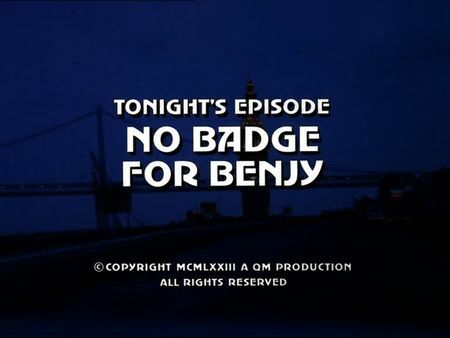 The screencaps for No Badge for Benjy were added to the episodes' page. Homicide has to deal with the murder of two very different victims: the one is a wealthy foreign businessman found stabbed down; the other one is an ageing black police informant, Benjy Hoskins, who is found shot in a telephone booth in San Francisco's red-light district while trying to pass information on a big bust to his police contact. Mike and Steve are trying to concentrate on the latter as most homicide forces are set on the businessman case. Hoskin's long-lost daughter, Vi, soon confronts them with prejudices against police and their attitude when poor Afro-Americans become a crime victim, and Insp. Dedini, also set on the Hoskins' case (being his police contact man), immediately fulfills Vi Hoskins' reproach. Nevertheless, Steve relentlessly tries to convince her that police is taking care of her father's case, and following another attempt on Hoskins' life in hospital, even Dedini is alerted. It turns out that the mobsters involved in the big bust got word about Hoskins' rôle as a police informant, so Mike and Steve need to rush - and to keep Vi Hoskins from taking justice in her own hands by putting her own life in jeopardy. The opening sequence of this episode offers a colourful potpourri of San Francisco's nightlife in the glittering red-light district around Broadway and Columbus. Benjy walks down Broadway and turns onto Columbus, then he enters famous 'The Saloon' blues club on Grant Avenue in order to collect information on the big bust that is going on. After accompanying two little girls on their way home, Hoskins turns onto Kearny from Broadway and talks shortly to a female caretaker he knows. Finally, he uses a telephone booth (where he is shot) at Vallejo and Romolo. We are also taken to SF General Hospital as well as to Vi Hoskins' apartment in the Mission Dolores neighborhood, precisely at Liberty and Dolores. Mike and Steve are questioning informer 'Cappy' at Chestnut and Hyde - offering that famous and beautiful view down towards the bay and Hyde Street Pier in background - and busting the mobster contacted by Vi Hoskins, Hayes, in his aparment at 1145 Kearny. The final chase includes Vi being picked up at Sacramento and Battery, whereas the car change takes place on Commercial St (this part of Commercial St is no longer existing as the Embarcadero Center was literally built on it). The episode's final was filmed in the industrial harbour, those warehouses have been demolished long time ago.